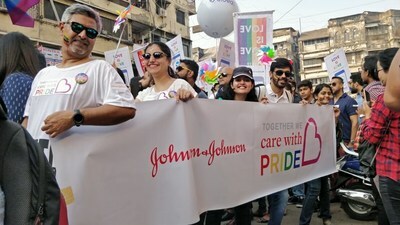 Walking in solidarity with the LGBTQ+ communities of the country, Johnson & Johnson (J&J) India participated in the Queer Azaadi Mumbai (QAM) Pride March – held on February 02, 2019. The March, themed ‘Pride For All’ saw 15,000 people come together to spread awareness and tell their stories. J&J India’s employees partaking the Pride March, came in light of the company’s official launch of Open&Out – a voluntary, employee-led community that represents a global network of LGBTQ+ at J&J and allies individuals who are open-minded and out to make a difference by creating safe and inclusive workspaces, fostering healthier communities and empowering all employees. In support of this revolutionary movement, to build a feeling of a progressive community and to make a positive difference, J&J India employees painted themselves in rainbow colours, chanted slogans of equality; and waved their pride flags to showcase the culture of diversity and inclusion at J&J India with the tagline- ‘Together we care with Pride’. At Johnson & Johnson, we believe good health is the foundation of vibrant lives, thriving communities and forward progress. We have aimed to keep people well at every age and every stage of life. Today, as the world’s largest and most broadly-based health care company, we are committed to using our reach and size for good. We strive to improve access and affordability, create healthier communities, and put a healthy mind, body and environment within reach of everyone, everywhere. We are blending our heart, science and ingenuity to profoundly change the trajectory of health for humanity. Johnson & Johnson spread its root into India 70 years ago. Since then, the Company has brought many innovative ideas, products and services to improve the health and well-being of people in India. The Company today employs more than 3,500 people and is organized into three business segments: Consumer Healthcare, Medical Devices and Pharmaceuticals in India.